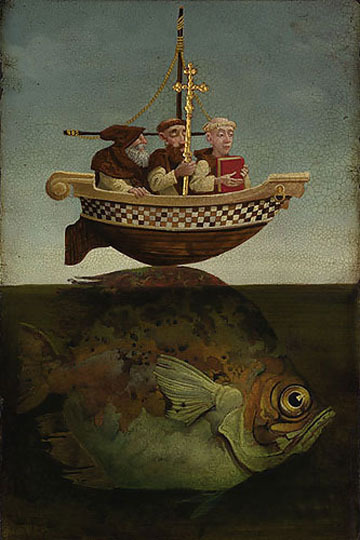 St. Brendan’s fame rests on the mythical adventure described in Brendan’s Voyage, a 10th century romance of Brendan and a company of monks sailing the Atlantic Ocean to the Promised Land. One of the stories of the voyage relates that Brendan, wishing to celebrate Easter Mass, landed on a small island in the middle of the ocean. After celebrating Mass, Brendan and his companions built a fire on which to cook a meal and thus awakened the sleeping whale they had mistakenly identified as a small island. Terrified, the voyagers rushed to their ship and fled. Since then, St. Brendan has been associated with whales and large fish.